What books am I missing? And what did you miss this year that you're hoping to go back and read? 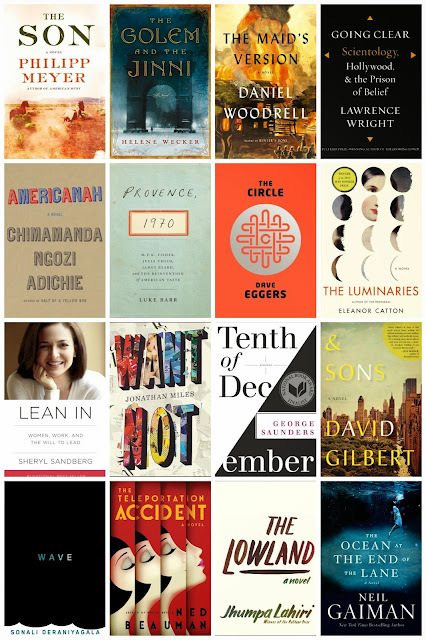 As I prepare for another great year of reading, I'm looking back at some of my reading goals for 2013 and noting that I particularly fell down in my goal of reading books I already own. I'm constantly distracted by the new shiny book on the shelves of the bookstores and libraries I haunt, and I'm collecting books at a rate far higher than I could ever hope to read. So to focus my efforts a bit in 2014, I'm signing up for Roof Beam Reader's 5th annual TBR Challenge, with the goal of reading 12 books I already own in the 12 months of 2014. This should not be that hard, right? Here's to a year of tackling the mountain of books I already own, getting to some oldies-but-goodies, and remembering why I bought all these books in the first place. Best Book I Waited for All Year: The Goldfinch, by Donna Tartt. I couldn't have a year-end list that didn't include this dazzling novel of a young boy, a stolen painting, and the way the latter shapes the life of the former. Like we've come to expect from Tartt, this novel is big, complex, and rich. It's downright wonderful. Best Book I Didn't Review: A Tale for the Time Being, by Ruth Ozeki. I put off reading this for reasons unknown to me, and I am kicking myself (HARD) for doing so. It's an amazing story of youth and forgiveness and life and death and happiness and philosophy and quantum physics and everything else you want to read about, so read it. Best Historical Fiction: Life After Life, by Kate Atkinson. I read a lot of historical fiction (of the 100 odd books I read in 2013, 24 were historical fiction), and I knew this would be one of my top reads of 2013 by the time I was 50 pages in. It only got better from there. This story of a woman who relives her life over and over and over again touches on so much of British history, World War II, the importance of will and desire in living (and dying) and so many other things, without ever feeling redundant. Read my full review of Life After Life. Best Audio: Joyland, by Stephen King. It took me a bit to get into the narrator on this one--he was somewhat flat and had a tendency to mumble--but by the end, his voice completely embodied the voice of Dev, a young man working in a potentially haunted amusement park over summer vacation. I'm only just diving into the world of Stephen King, and this was another hit for me. Read my full review of Joyland. Best Horror: NOS4A2, by Joe Hill. I've never been a big horror reader, so the fact that I read more than one contender for this category is pretty shocking. Night Film and The Shining Girls were both excellent, but NOS4A2 had the added elements of wit and imagination that really win me over in a book. And it's downright terrifying at times. Read my full review of NOS4A2. Best Feminism: The Woman Upstairs, by Claire Messud. Holy highlighter, batman. I noted and annotated so many pages of this book (which was a library copy, which meant lots of post-it notes) because so much of it resonated in ways I can't begin to explain. If you read books to find characters you love, don't read this. If you read it to find a story that speaks to the anger and rage that so many people--particularly women--feel at being pushed into a life they never expected, too scared to fight for their dreams, well, read this. Best Indie Press Read: The Revolution of Every Day, by Cari Luna. I picked this up at BEA at the urging of Catherine from Gilmore Guide to Books, and I'm so very glad I did. This is a quiet story at first, about a group of squatters living in an old tenement building in the East Village, but it builds to a startling climax that forced me, as a previous resident of the neighborhood (and part of the very gentrification against which these squatters fought) to reconsider the basic right of housing that so many of us take for granted. Best Nonfiction: Gulp, by Mary Roach. Because it would be impossible for Roach to publish something without my reading it, impossible (I hope) for her to write something I don't love, and impossible not to include a new Roach book on a best-of list somehow. Best Biography/Memoir: The World's Strongest Librarian, by Josh Hanagarne. Libraries + books + faith + dealing with Tourette's + strongman weightlifting = recipe for one helluvan intriguing read. It doesn't hurt that Hanagarne's a damn good storyteller, or that his memoir will grow your TBR list in droves, either. Read my full review of The World's Strongest Librarian. Best Sports: Running Like a Girl, by Alexandra Heminsley. Ok, this might be cheating because I think this is the only "sports" book I read all year, but I loved it, and want to keep telling everyone to read it, so I'm going to do just that: Read this. It's funny and witty and inspirational and encouraging for wannabe, newbie or seasoned runners alike. Read my full review of Running Like a Girl. 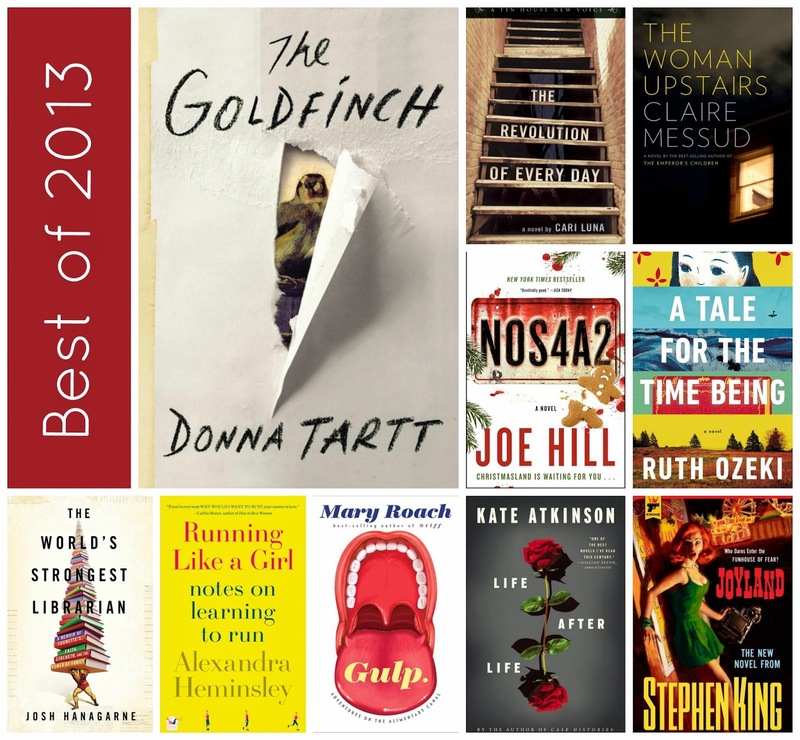 That's the best of 2013 from my year in reading. 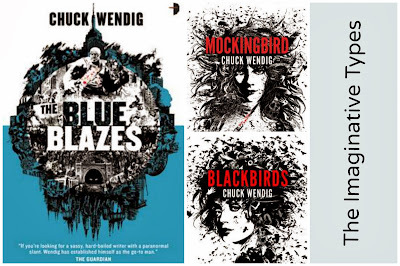 I know I missed some really wonderful-looking books, many of which I have stockpiled in my house and on my e-reader, and I'm hoping to get to those sooner than later--what should I be sure not to miss? This review originally ran in the Friday, November 22nd issue of Shelf Awareness for Readers. If you don't already subscribe, sign up here for a bi-weekly dose of bookish goodness in your inbox. Like most Gentiles in the Nazi-occupied Paris of Charles Belfoure's debut novel, Lucien Barnard has no great love for Jews. Strapped for cash, however, the architect accepts commissions to design hiding places for Jews in exchange for considerable sums of money and the promise of lucrative building contracts. But when one of his hiding places fails, he is no longer able to keep his emotions separate from his work, and finds himself drawn into a dangerous game of two-timing the Germans: working for them by day, designing spaces against them at night. 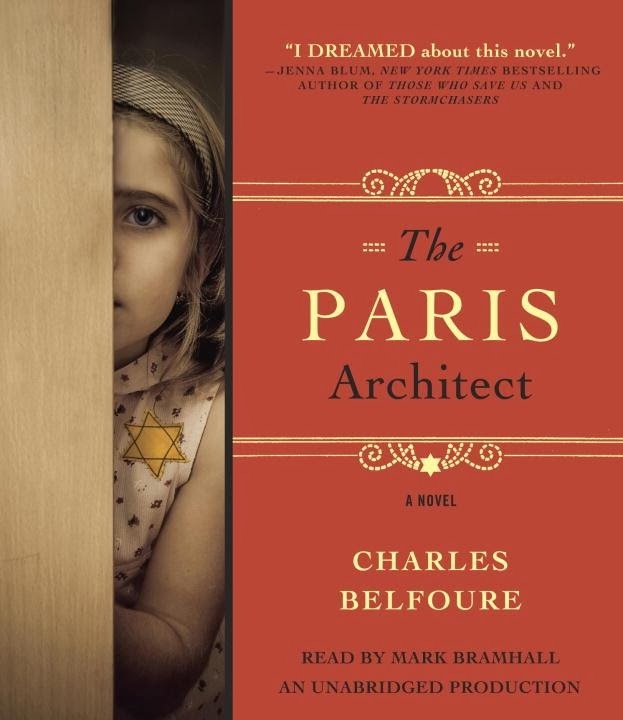 Along with the architectural details that reveal Belfoure's own pre-literary architectural career, the historical details of The Paris Architect bring to life the terrible and terrifying atmosphere of the occupied city, from neighbors turning each other in to the Gestapo to the brutal public murders of Jews and their protectors. The novel's supporting cast is vast and varied, but narrator Mark Bramhall gives each voice enough differentiation to make Lucien stand apart from the crowd of characters. His portrayal of Lucien's emotional experience transforms a despicable, unlikable character into the unlikely protagonist of an adult coming-of-age tale, staring down his own cowardice and greed in the face of human kindness. This review originally ran in the Tuesday, December 10th issue of Shelf Awareness for Readers. If you don't already subscribe, sign up here for a bi-weekly dose of bookish goodness in your inbox. 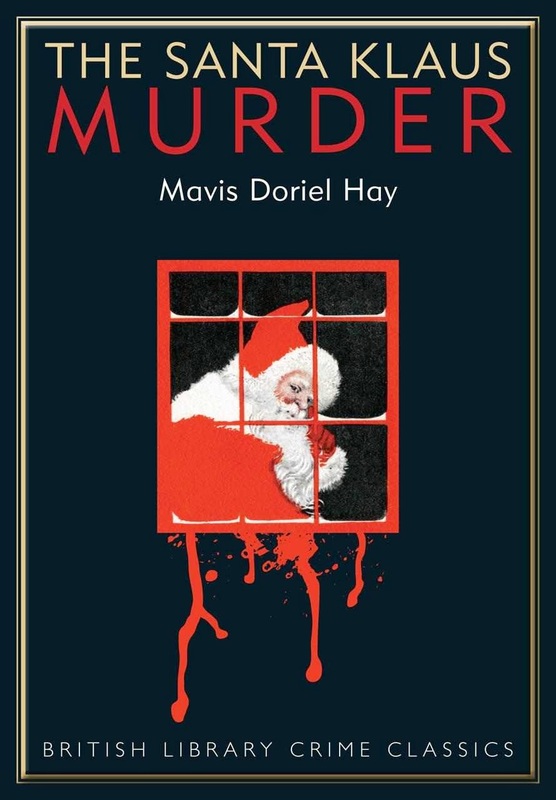 The Santa Klaus Murder, one of three detective novels written by Mavis Doriel Hay in the 1930s, is a classic country-house murder mystery with a holiday twist. The story opens with the gathering of Sir Osmond Melbury's family at his estate for the Christmas holiday. The grandfatherly figure, known for his wealth and lack of patience, has planned an elaborate Santa Klaus ruse for his grandchildren, complete with gifts and holiday noisemakers. But when Sir Osmond is found shot in the study, every member of the family comes under suspicion. Was it his youngest daughter, seeking to claim her inheritance while marrying against Sir Osmond's wishes? Was it his oldest son, hoping to protect the fortune from his money-grubbing sisters? Or was it his eldest daughter, bitter over having been denied her income for also choosing a husband not to her father's liking? As the details unfold, it becomes apparent each and every member of Sir Osmond's rather unlikable family had a motive to kill the patriarch, and it is left to Colonel Halstock to determine which family member had not just the motive but the opportunity. 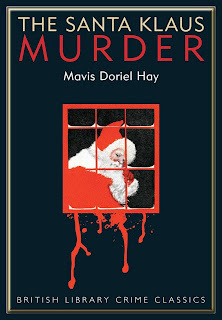 Part of the British Library's Crime Classics series, The Santa Klaus Murder is a re-issue of a forgotten British cozy that warrants attention as both a classic British mystery novel and as a holiday read. The large number of point-of-view characters can be confusing at times, but once the story finds its footing, it moves stealthily toward an intriguing and not altogether predictable conclusion. A book you are willing to cut up (this is the hardest part, I promise). Every year, the holiday shopping frenzy seems to get bigger and bigger. As Brett Arends points out in this interesting (if overtly religious) MarketWatch article, we can no longer even expect to enjoy a Thanksgiving meal without being inundated with the calls to shop, shop, shop. 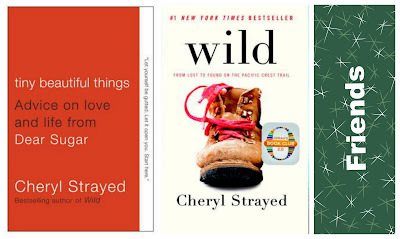 Out of Print Clothing (and gifts and jewelry): For every purchase made on Out of Print's site, one book is donated to a community in need through the site's partner, Books for Africa. And they have awesome bookish goodies, from t-shirts to fleeces to necklaces to tote bags to journals. "AmazonSmile is a simple and automatic way for you to support your favorite charitable organization every time you shop, at no cost to you. When you shop at smile.amazon.com, you’ll find the exact same low prices, vast selection and convenient shopping experience as Amazon.com, with the added bonus that Amazon will donate a portion of the purchase price to your favorite charitable organization. You can choose from nearly one million organizations to support." Amazon may not be the best friend of indie bookstores across the country, but if you're already shopping on Amazon, this is a simple, no-brainer way to make your purchase give back--and you can select your charity, allowing you to customize your donation. The list of participating charities is loooong, and includes regional and national organizations. FirstBook: FirstBook is an organization committed to obtaining access to new books for children in need. You can shop the FirstBook Gift Catalog, selecting from sets of books or more general support funds, in the name of your gift-ee, or you can make a donation directly to the organization in honor of your gift recipient. Now through December 31st, all donations will give triple the number of books to children in need due to a matching offer. 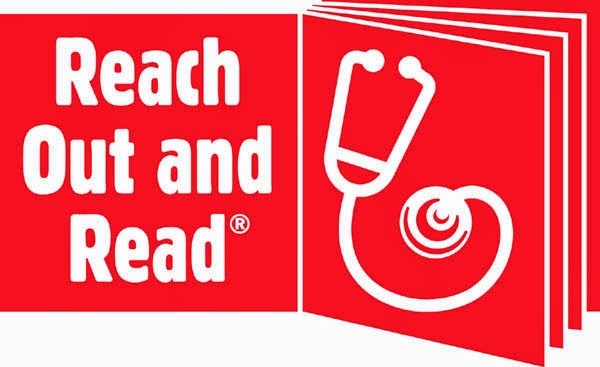 Reach Out and Read: Reach Out and Read serves 4 million children annually, according to their website, with 5,000 program sites nationwide (in all 50 states). 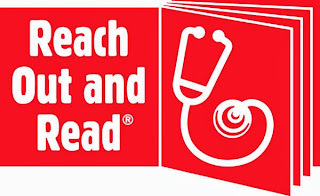 They distribute new books to children and advice to parents on the evidence-based benefits of reading aloud. You can donate directly on their site and make the donation in the name of your gift recipient--and they currently have a match that will double all donations made (up to $250,000). I'm wrapping up posts gift books with one of my personal favorite categories--books for geeks. 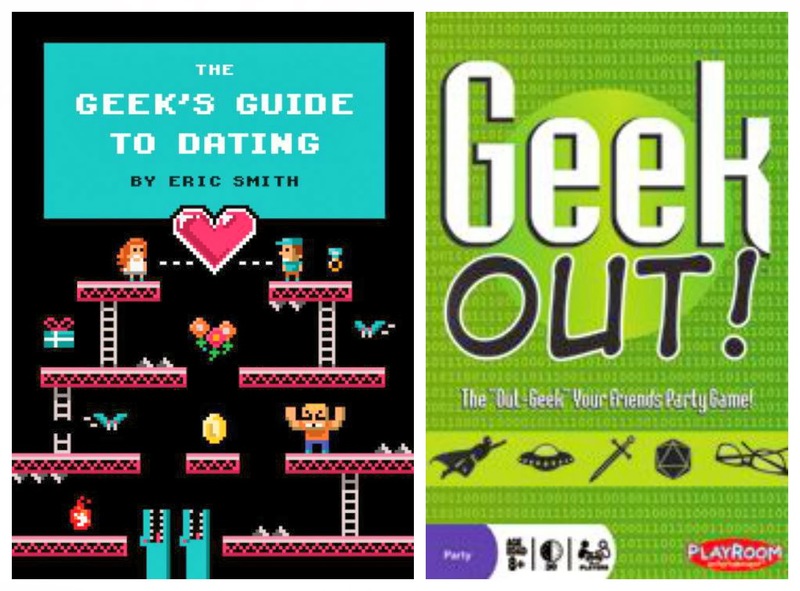 As Eric Smith points out in the introduction to A Geek's Guide to Dating, "Being a geek means a lot of things... What was once a derogatory terms for a socially inept person has now been taken back by a community proud to wear the title. A community comprised by people just like you and me. We're eccentric, enthusiastic, intelligent, and, occasionally, kinda awkward." And the good news is there are a ton of books just perfect for us geeks, no matter what geek variety we may be. 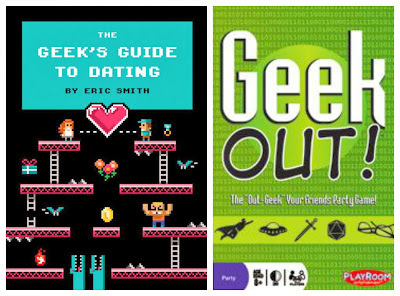 Up first, the already-quoted A Geek's Guide to Dating, by Eric Smith. 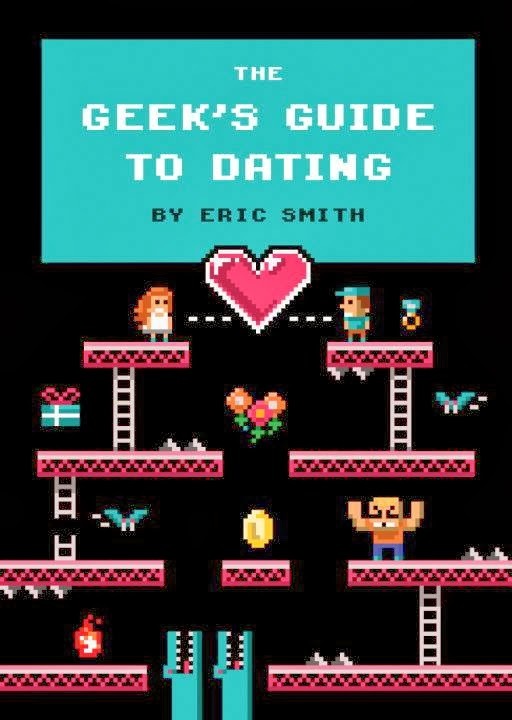 While this one may need to be gifted carefully--you don't want to imply to someone that he/she is incapable of landing a date on his/her own--it's a clever, witty, and informative guide to dating for today's geeks, whether they be computer geeks, math geeks, Star Wars geeks, and so on. Plus, it's packed with obscure geek culture references that read like insider baseball for the non-baseball geek types. Buy here ($14.95). Bonus: Geek Out is a trivia game made for the geekiest of the geeks, pitting players' knowledge of geek culture, trivia, and lists against one another. The kicker? No internet allowed, which means "correct" is determined by player consensus. Buy here ($19.95). William Shakespeare's Star Wars, by Ian Doesching: Sure, yeah, I already included this one in my recommended gift books for Shakespeare fans. But this book swings both ways, and any Star Wars fan is sure to appreciate the quirky cleverness of the Star Wars story told in Shakespearean verse. Buy here ($14.95). Darth Vader and Son, by Jeffrey Brown: Star Wars-fanatic dads with sons now have the perfect bedtime story to read every night on repeat. Buy here ($14.95). Jedi Path and Book of Sith by Daniel Wallace: Let your well-loved geek find his or her inner Jedi (or Sith) with classic Star Wars training manuals. Buy here ($19.95) and here ($19.95). Bonus: Steep some Star Wars-themed tea with a Death Star-shaped tea infuser (buy here, $19.99) in an Imperial mug (buy here, $9.99). Stellar Cartography, by Larry Nemecek: Ten large-format maps of the Star Trek universe, fully illustrated and downright beautiful. Buy here ($79.99). Star Trek Federation: The First 150 Years, by David A. Goodman: The price tag on the deluxe edition of this book is steep but worth it. The gorgeous, illustrated hardcover sits on an electronic display stand for added intrigue, presenting the first 150 years of the Star Trek Federation in great detail. Buy here ($99.99). Bonus: Take the Star Wars tea one step further with Captain Jean Luc Picard's favorite beverage: Tea. Earl Grey. Hot. Buy here ($14.99). The Feast of Ice and Fire, by Chelsea Monroe-Cassel, Sariann Lehrer, George R.R. Martin: The dishes from Martin's imaginative series brought to life. Yummm. Buy here ($35.00). Game of Thrones: A Pop-up Guide to Westeros, by Michael Komarck, Matthew Christian Reinhart: Five spreads unfold to create an elaborate, illustrated map of Westeros. Let the geeking out commence. Buy here ($65.00). Bonus: Track down some Game of Thrones-labelled beer (yes, it really does exist) and add one of these amazingly amazing (they are that amazing) horn mugs, and your Thrones-loving fan can eat, navigate and drink like a true citizen of Westeros. Find a beer retailer near you, and buy the mug here ($52.95). The Annotated Alice in Wonderland, by Lewis Carroll (with annotations by John Tenniel and Martin Gardner): Give the curioser and curioser something to satisfy their curiosity with the text of Carroll's beloved stories coupled with annotations on the wordplay, mathematical riddles and other hidden tidbits. Buy now ($29.95). Alice in Tumblrland, by Tim Manley: Alice and other fairy tale characters have found their way into the 21st century, land of Tumblrs and Twitters and internet dating. Buy now ($20.00). Bonus: Out of Print's line of Alice goodies are all wonderful, but their new jewelry products feature a necklace with Alice herself jumping after the white rabbit. Buy now ($32.00). Tomorrow: Gifts that keep on giving. 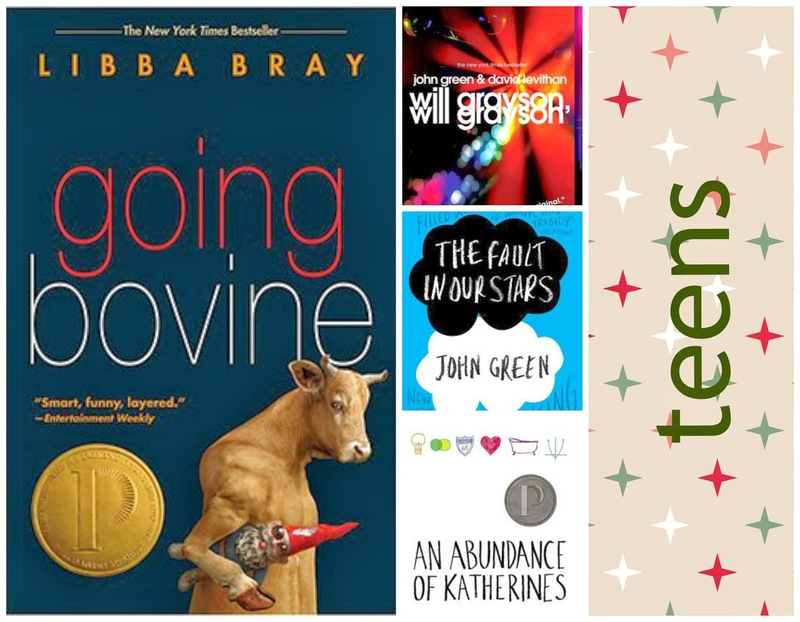 With the holidays upon us, I'll be highlighting a few of my go-to gift books this week and next. Up first: gift ideas for the classic-lover in your life. Since most devoted bookworms already own the obvious classics from their favorite authors, the following are ideas for expanding beyond another edition of collected works in favor of more fun and quirky gift ideas. The Sonnets and A Lover's Complaint: Sure, these works are most likely included in the edition(s) collected works that your Shakespeare lover already owns, but nothing will make a bookworm's heart race like a Coralie Bickford-Smith clothbound Penguin edition. Buy here ($22.00). William Shakespeare's Star Wars, by Ian Doescher: Shakespeare + Star Wars = The Perfect Geek Gift. Well, the perfect geek gift for any scifi/literary geek in your life. And as an added bonus, if it's a hit--Doescher has two more Shakespeare-inspired Star Wars tales coming out from Quirk Books in 2014 (The Empire Striketh Back, March 2014; The Jedi Doth Return, July 2014). Buy here ($14.95). Bonus: Let the Shakespeare lover in your life wear his/her passion with a snuggly fleece from Out of Print. Buy here ($42.00). The Man Who Invented Christmas, by Les Standiford: Subtitled "How Charles Dickens's A Christmas Carol Rescued His Career and Revived Our Holiday Spirits," Standiford's book is an engaging, interesting dive into Dickens' career and our Christmas traditions through the lens of one of the most-adapted Christmas classics we know. Buy here ($14.99). Bonus: Snuggle up to listen to the story, read about its history, or watch a movie adaptation under a "Bah! Humbug!" blanket. Buy here ($39.95). The Real Jane Austen, by Paula Byrne: A deep dive into the "small things" that comprised Austen's life--and shaped her witty, insightful prose. Buy here ($29.99). A Jane Austen Education, William Deresiewicz: How six Jane Austen novels changed one man's life--stories sure to resonate with any Austen fan, and maybe even help them see something new in the texts they've missed in past reads. Buy here ($14.99). Bonus: Bundle up in an infinity scarf printed with text from Persuasion. Buy here ($42.00). Or give your Austenite something to tote around all those books with a Pride and Prejudice tote. Buy here ($18.00). 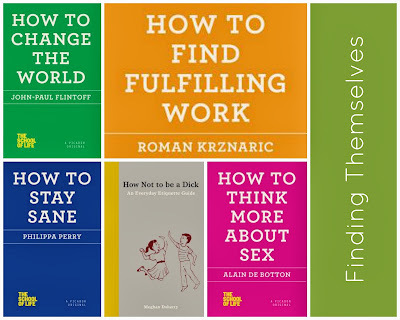 Tomorrow: Book recommendations for hobbies and habits. Frog Music, by Emma Donoghue (Little, Brown & Company, April 1): Believe it or not, I've never yet read any of Donoghue's work (though I have several of her titles on my shelf). Here, she returns to historical fiction, based on an unsolved murder in 1876 San Francisco. Magician's Land, by Lev Grossman (Viking, August 5): The third book in Grossman's Magicians trilogy, following up on The Magicians (2010) and The Magician King (2011). I've been waiting since 2011 for this book, and am thrilled that it now has an official pub date. Perfect, by Rachel Joyce (Random House, January 14): Joyce's debut novel, The Unlikely Pilgrimage of Harold Fry, was the kind of book I loved so much that I never reviewed it, fearful that trying to put my thoughts in words would somehow dilute the experience of it. Needless to say, there's no way I'm missing her sophomore effort. The Martian, by Andy Weir (Crown, February 11): One of the first men to set foot on Mars is accidentally left behind, thought to be dead after an unexpected dust storm. Sounds creepy, scientific, and outer-spatial, and comes with lots of bloggers already buzzing. When Everything Changed, by Gail Collins (Little, Brown & Company, April 2014): This one is a bit of a cheat, as it's a "Keepsake Issue" of a twenty-year old title, but Collins approach to the history of feminism from 1960 to today intrigues me, and I love the idea of combining this account with space for individuals to record their own or their family member's own memories of each time period covered. The Temporary Gentleman, by Sebastian Barry (Viking, May 1): I loved Barry's The Secret Scripture, and didn't realize until browsing through Edelweiss that he had a new novel out this year. This is the story of an Irishman who fought in WWII, and is--I've just learned--a continuation of Barry's "separate yet interconnected novels that brilliantly reimagine characters from Barry’s own family." To Rise Again at a Decent Hour, by Joshua Ferris (Little, Brown & Company, May 6): Like Ferris' previous two novels, this novel promises a story of one man searching for meaning in an otherwise absurd world--this time a Luddite who finds someone impersonating him online. 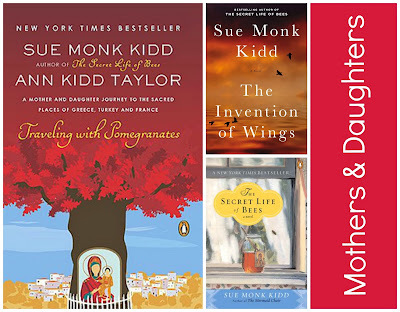 The Invention of Wings, by Sue Monk Kidd (Viking, January 7): I loved The Secret Life of Bees, and read Kidd's Traveling with Pomegranates, which she and her daughter co-wrote, at a time when my and my mother's life almost directly paralleled Kidd and her daughter's life. She's solidly on the list of "I'll-read-anything-she-writes" authors, and this story of an slave in 19th century-Charleston and her daughter looks more than intriguing. Unlearning with Hannah Arendt, by Marie Luise Knott (Other Press, May 13): I wrote a paper on the banality of evil in a college history class, drawing deeply on Arendt's teachings as well as works from other authors, and the topic has long intrigued me. Knott's book is hailed as an examination of the innovative strategies Arendt used to arrive at her now-famous theories. 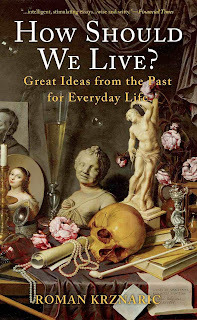 Astonish Me, by Maggie Shipstead (Knopf, April 8): I haven't read Shipstead's debut novel, Seating Arrangements--yet. But after all the praise it received from bloggers and reviewers I saw, I don't plan to miss her second novel, which focuses on the world of professional ballet. What books are on your 2014 must-read list? What have you been waiting for? Top Ten Tuesday is a weekly meme hosted by The Broke and the Bookish. See everyone's answers to this week's prompt over on their site. 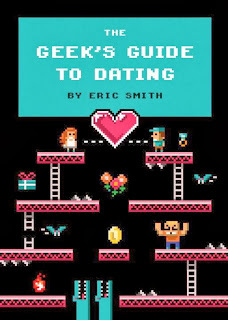 The Geek's Guide to Dating, by Eric Smith (Quirk Books, on sale December 3): The title of this book, and the cover of this book, and the content of this book. Just love. Smith has created a dating-guide that is actually interesting enough in its own right that I read it cover-to-cover... and I'm married. The book is full of solid dating advice and peppered with geek culture references ranging from Star Wars to Doctor Who to RPGs to WoW to Battlestar Galactica. Confession: Some of these references went right over my head, and I now feel the need to go up my geek cred so I can continue to hang with my geek-ish husband. 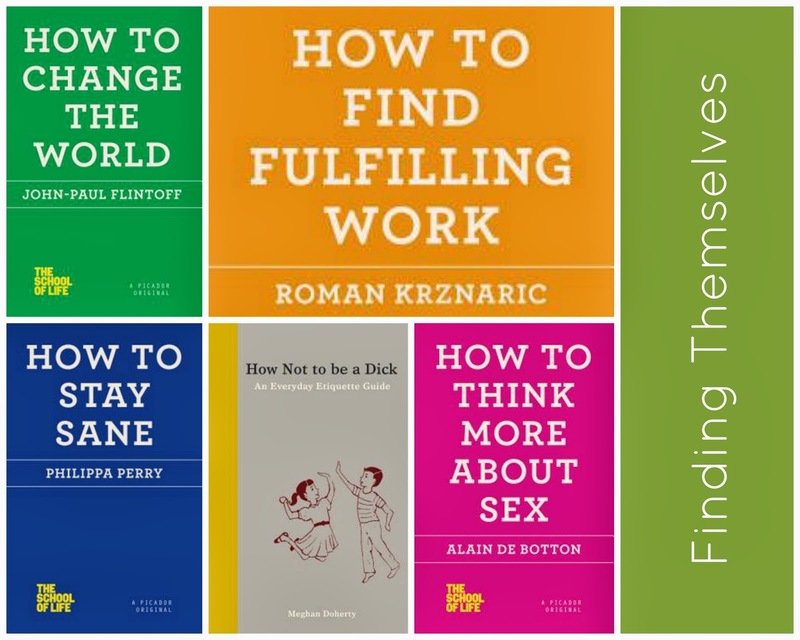 How Should We Live?, by Roman Krznaric (Bluebridge, on sale December 1): I read and enjoyed Krznaric's How to Find Fulfilling Work earlier this year (hellooooo, quarter-life crisis), and am excited to take a look at his newest book, How Should We Live? Here, Krznaric looks back at history to uncover wisdom on how we all should live our day-to-day lives. 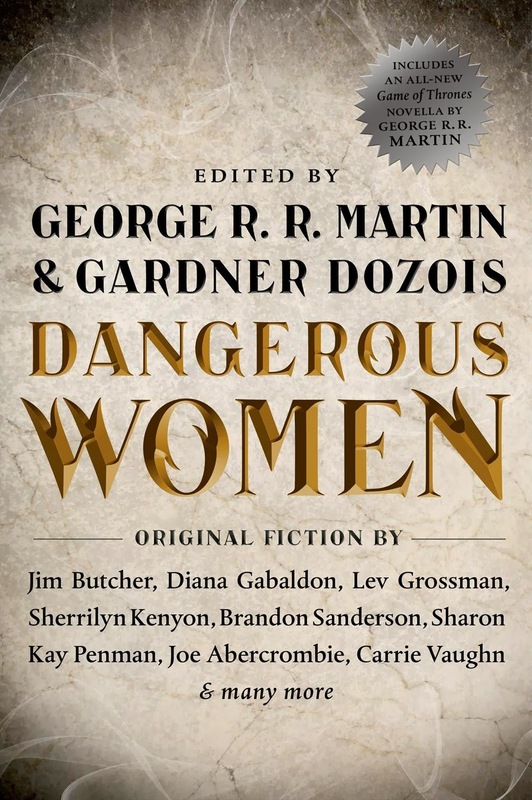 Dangerous Women, ed. 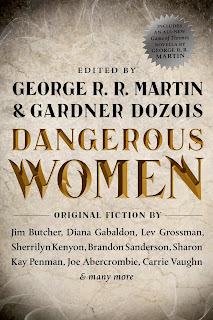 by George R. R. Martin and Gardner Dozois (Tor, on sale December 3): Twenty-one new and original stories featuring dangerous women ("no hapless victims who stand by wimpering in dread") from some of the best genre authors I know: George R. R. Martin, Diane Gabaldon, Brandon Sanderson, Joe Abercrombie, and Lev Grossman. People, what more could you possibly want?